My third time doing eggs benedict and I pleased with the results (visually), as the poached eggs could be done better. 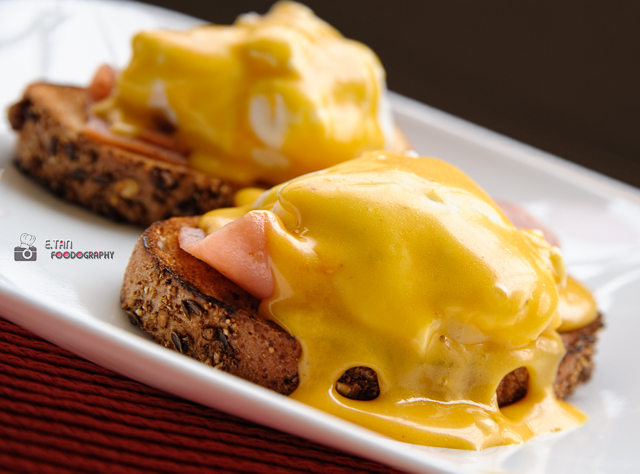 Eggs benedict is a classic item in the brunch menu which compose of English muffins, Bacon, Poached eggs and Hollandaise sauce. I did some changes to the recipe, by swapping the starch to Walnut Country Loaf and the protein to breakfast ham. Hollandaise sauce was a mixture of egg yolk, butter and a dash of cayenne paper to add some spice to it. Eggs were poached in water with added white vinegar. The loaf and ham were toasted on a pan.